I haven't had a lot of production time over the past two weeks, but I feel so much better and I've kept up with my drawings and plannings and my coursework, and I am really really excited about some of the things that are happening. This chicken cup is one exciting thing: I really like using mishima- even though it's a bit time consuming, it's also immediate and really a lot faster process than drawing and bisque firing and then coloring and glazing and firing again. I'm looking forward to making more of these, in red and in blue, and in drawings that aren't necessarily chickens. Though I am happily chicken-obsessed. Admittedly. Chickens, bees, pots, gardens, food- my passions. I am bringing home three new chicks in the next few weeks- one has already been "adopted" and named by my dear friend and studio assistant, Natalie. One little chickie will be Trudy, named after her mom. I'm excited to have a little namesake. Edna and Pearl are both named after Gary and my grand and great-grandmothers. I like the old fashioned names. Maybe there will even be some baby chick pieces that come out of our adventures in chick-raising again. I let the girls out this morning, as I do most mornings that I'm puttering out in the garden. They are so curious and come running towards me when they lose sight of me. This is from this morning, when I did some light gardening and sprucing up with my coffee. Mmm, toes. Pearl is the bearded araucana chicken. Edna is my star layer, a black-star chicken. Happy Spring, friends. Oh, and if you're chicken-obsessed like I am (or you love someone who is), these chicken tumblers will be in the shop when they're ready in another 2 or 3 weeks. 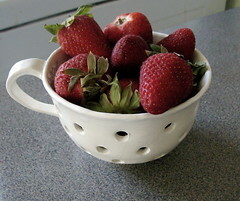 In "everyday pottery", "home life"
Earlier this summer a woman from Australia contacted me about my ladybug pottery. She asked for this breakfast set, pictured. Five little mugs, bowls, ramekins, and a honey pot, sugar bowl, and creamer. I hope they love it and use it every day. I'm a bit nervous, though, because this may be the largest order I've ever shipped. It went out on Wednesday, and even though it is VERY well-packed, I'm literally praying over it. Shipping overseas makes me anxious. I am 100% comfortable with my corrugated cardboard wrapping and paper filling, but it is heavy. This time I'm using bubble wrap and styro peanuts. Shifting (and resulting breakage) is my biggest fear. I've shipped to England a time or two, but Australia is another matter entirely. That is a LONG way from Memphis, TN! We're headed out on a mini-vacation today. I'm so excited to see old friends and new ones, too. More on that later! I've got a post or two scheduled for while I'm gone, and I've been making work like crazy. I'm not going to put anything new up on Etsy until after Thanksgiving. I've neglected my local base for online customers all summer, so it's time to focus on folks in Memphis for a bit. That being said, if you have something in mind for holiday giving, let me know and I'll be happy to add it to the list. Our weather has turned just glorious here- cool crisp mornings, temperate days, bright blue skies. I hope yours is just as nice. Yesterday I was over at my friend Lane's house for her son's birthday party. Our boys are the same age-they met at our library's wonderful story hour a few years ago. She really knows how to throw a fun party for the kids. Over the past two summers, Lane's built up quite a collection of my bud vases. 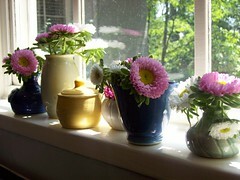 I was thrilled to see them all lined up on her kitchen windowsills filled with white and pink posies. There's a second set on the other side of the window- similarly lined up and filled. They looked so cute that I had to run home and get my camera! most of the photos of my pottery on this blog are pictures that I've taken with my little Kodak EasyShare C603 Zoom. It wasn't expensive, although my days as a college and graduate student, living on less than $500 a month, have permanently colored my vision of personal finance and I'm extremely careful with spending, so that $150 or so felt like a small fortune. Eventually, we'll upgrade, but I take almost all of my pictures with the macro feature (forgive my dismal knowledge of photography lingo) and I'm pretty pleased. This photo was taken by Kim, who ordered a set of herb and vegetable markers from my shop. I love it- it is so different from my other herb marker photos- maybe just because it's in her garden and not in mine! Many of you have seen Molly's berry bowl. One of my college friends recently said that it looks like a professional food photographer took it! This week Jennifer took another lovely photo of the bowl and shared it on her blog. Again, I see food-styling in her future! I'm tickled to see my work in use in your lives*- creating work to enrich daily living is one of the biggest reasons I do what I do. Well, also, I don't think that I could stop. This coming week may be post-light as I work towards glazing and cleaning the house for my sale this weekend. I'll still be around, so I'll see you later! *Sunday edit- Michele of calico daisy added some pictures of my butter dish here. Thanks Michele!! 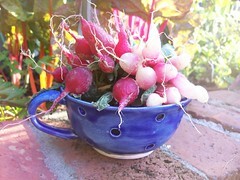 I'm up early this morning, taking pictures of home-grown (though not by me) radishes in my berry bowl for the postcard invitation for my summer sale. I love the early morning light peeking over the roofline of my house, illuminating the potager (fancy french for kitchen garden. No, I don't speak french, I just like to *think* that I do. he he). This bowl is cracked, so it's staying with me, but I knew that it would look wonderful with these white-tipped breakfast radishes and the traditional red globe ones. The radishes came from Keith and Jill Forrester, owners of the Whitton Flower and Produce Company. They sell at the market I frequent, as well as the Memphis Botanic Garden mid-week market in East Memphis. They just started a CSA service, which I'm signing up for in the fall. Beautiful produce, flowers, and service. And I can't wait to eat these radishes with salt and butter*! Hello to all of you who have come over from Molly's blog. She takes a lovely photo, doesn't she? Thanks, Molly, for letting me use this (and I'm happy to report that it's no longer thumbnail size)! So, if you're here because of this little bowl, and you want one, I'm planning to start making them on Monday afternoon (**edit, I started today, Sunday 5/11). Do you think you could drop me a line (bridgmanpottery-at-yahoo) so that I can estimate how many I'll need to make? Maybe put "berry bowl" in the subject line? Then I can let you know what my guestimate is for the price and also when I think they'll be ready (end of May-ish if I really get my pottery groove on). I love how it turned out in white, but yellow, blue, and celadon will also be available. I really appreciate all of the enthusiasm out there for this little guy! A friend requested this sweet little bowl from me maybe a month or so ago. I'm really pleased with it and am planning to make more of them. When Gary and I married we got a little bowl like this as a wedding gift. We used it constantly- it was in the fridge, filled with grapes, strawberries, or wild blackberries more than it was in its cabinet. One day, it fell out and broke- cold pottery breaks really easily for some reason. The fall wasn't a large one, but it cracked in two almost even pieces. I was very sad and set about trying to duplicate it. I never did "get" it, but that was almost 7 years ago, and I'd like to think that I'm a better potter now. My only problem with this edition of the berry bowl was glazing- Molly likes the white glaze, and it is one of my favorites, as well, but I have trouble getting it right. I glazed it once but the pigment had settled too much to coat the bowl properly. The second firing came out just about right, though, so this little guy is about to be packed up and shipped off to its new home. I hope it has a long, happy, and useful life! I had been coveting the Gaiam bag dryer for years, but I refused to put up the $20 plus shipping. In January, when I read about Danny Seo making a similar dryer out of a thrift store toothbrush holder, inspiration struck. I made this little yellow self-arranging vase for summer zinnias a year or so ago. It was sitting, sad and forlorn, in my china cabinet with the other out-of-season vases this winter. Out it came, and filled with take-out chopsticks (and a few of our "nice" ones), it sits on my kitchen window sill. I use it every day to dry the plastic zipper bags I reuse. This shape, by the way, is the same shape as "not great aunt edna's teapot". I like this classic greek-inspired form and use it fairly frequently. It's full-swing spring here in Memphis. The garden is starting to pop- most of the daffodils are already gone from my flowerbeds but the herbs and other perennials are really leafing out. My Kentucky Colonel mint (the best for juleps) is starting to put out some nice, large leaves. I passed its bed (because, as I'm sure you know, mint likes to take over) and remembered that I had only 2 cups left in my pottery stash, so on Friday I spent some time in the studio making a set of Julep Cups. These were Gary's first great pottery idea. I was hesitant, but after my first dozen sold, they became a fixture. To me, these cups embody the ease and enthusiasm of spring (and of our old annual Derby-Day julep parties), and they are one of my favorite wedding gifts for folks who like to entertain. Juleps can make a body a little wild- they're something to be sipped, not gulped. The basic recipe is a cup of chipped ice, a tablespoon (or more) of simple syrup or slightly less superfine sugar, a couple of mint leaves, muddled, and a glass full of bourbon. I'm a lightweight, so I fill half the glass with club soda before adding the bourbon. While these drinks are traditionally made in sterling or pewter cups, I think mine are a fun option. Cheers! I've mentioned that when I go into the studio, especially if it's been a while since I've thrown, I always start out by making small items, like bud vases or tiny bowls. These bowls are usually grouped in a large flat basket like the one pictured at left, a treasure trove of colors, textures, and shapes, all priced at a point where almost anyone, even my youngest customers (usually little girls with allowance money, attracted by the bright candy colors) can afford them. I love to watch my customers stack these bowls in their basket, rearranging them by shape and color. This is where I let myself go a little crazy with my colors- you won't find that granny smith apple green in much else that I make. These tiny bowls are really useful, too. I have a small stash of them in my kitchen to use for salt or chopped herbs when I'm cooking- a casual mies en place. Larger, deeper bowls are good salt cellars. I like to use them for dipping bowls for homemade spring rolls and nam plam-based sauces. Two sit on my kitchen window sill- one for rings, one for a small cake of soap my little boy likes to use for washing his hands. I keep one in my bathroom- it is very shallow and wide, perfect for swirling around a kabuki brush in mineral makeup powders without making a huge mess(I am hooked on everyday minerals, which offers free samples and a huge range of foundation colors- at a fraction of the cost of well-known brands). 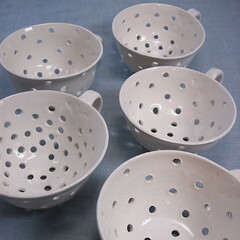 A friend uses hers for spoon and teabag rests-both are shallow, flattish bowls, another selected deeper bowls, still not quite ramekins, similar to the white bowls with blue and green interiors on the right side of the basket, for serving condiments. 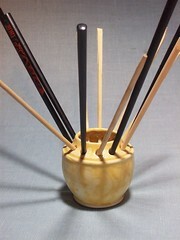 It's been fun for me to see and hear the creative uses friends and customers have come up with for my tiny bowls. A while ago my neighbor was over for a visit and cofessed, aghast, that she had finally used my bamboo tumblers (I had given her a set of 4 as a gift two years ago) for coffee, but her daughter had put them in the dishwasher. I laughed, opened my dishwasher, and showed her something like this. It's full of pottery- mine and others' work. While I may not put my platters in (they're oddly shaped, sometimes, and difficult to stack around), I do not hesitate to put anything else that I've made in. So here you'll see ramekins, my family's favorite cafe au lait bowls, bamboo tumblers, and the butter dish, because it was full of melted butter after I found it sitting on top of the toaster oven. While I firmly believe that children should be able to use appropriately-sized versions of the same things adults use- I even make pottery for children- you DO see my boy's blue plastic cups from Target in there too. Previous owners of our home installed beautiful blue slate floors in the kitchen (which I hate). Everything breaks- even the tempered glass picardie glasses, although it takes a second drop for them- on contact with these beautiful but deadly floors. So until the boy gets taller or we can replace the floors with cork (a dream, but not in this lifetime)- he gets unbreakable. There are health concern with heating plastics, I know, so these only hold cold liquids. He has his own special mug for hot chocolate, which never drops, but the plates and bowls come crashing to the floor with such regularity that I can't give him all handmade yet. Also, little round plastic lids? Yogurt machine. Yum. One small appliance I wouldn't be without! We're expecting a busy and snowy weekend here- but this was from last weekend, when we had glorious late-spring like weather. This photo is blurry- I cut the focused part out-we're out in the country at my mom's, gathering golden cups of joy. This is what I call my "mork and mindy" tee shirt. You can almost see my red glasses. I have a friend who once said that my pottery just didn't "do," it for her ("fair enough", I said, because to each her own, and it didn't really hurt my feelings) because there wasn't enough color. Jolts of blue, check, yellow, check, but admittedly, the bulk of my work is white, white, white. Because looking around at my home, my closet, even my lipstick stash, all I see is color- bold, vivid, pure pigments. Nothing shy or retiring. My favorite coat is the color of cooked gulf shrimp. Lipstick? Red. I own 7 pair of red shoes. Purse- red. Winter hat- emerald green. I guess I have to be restrained somewhere, and in my home, white stands out, especially when viewed on my yellow kitchen table. Also, I think, white makes the form stand out more than color, and I like to focus on the form and shape of my pottery more than its glaze color. Plus, a girl's eyes have got to rest somewhere, right? Off to enjoy a day of sunshine before the snow (maybe) comes! All of our pets have had handmade dishes-so after dear Pete died last year at 15 (he had his own bowl, but it broke when little boy was a toddler who enjoyed picking up and dropping everything)and we had recovered sufficiently to talk about getting another dog, Luther got his own bowl. There was a Luther bowl before there was even a Luther. Our son came to me one day and said, "Mama, we need a new chocolate lab and we need to name him Luther." We have a dear friend named Luther, the only Luther little boy knows, so I said that after we asked permission (which Luther-the-man kindly granted), we could start looking. I was too heartbroken to get another chocolate, but when a wild year-old black lab pup wandered into our lives, he already had a bowl waiting for him. Birdy, our blonde old-lady lab-mix, also has her own bowl, but she prefers to eat out of Luther's. Luther eats out of Birdy's little dog-bone strewn bowl, and his own, if Birdy leaves anything in it. This coming weekend my son's preschool is having its annual auction- we've put in this, which Gary took in 2000, a ladybug teapot, a "paint-it-yourself" platter that I threw, and a bowl like Luther's, customized with the winner's pet's name (little boy's class put together an adopt-a-dog basket, complete with a dog from the Humane Society). While this preschool is private and church-operated, the school's focus is on preparing their students for the accelerated program at the neighboring public elementary school. All of the money raised at the auction goes to providing scholarships for needy students. I love to have flowers around. Just a blossom or two. Roses, a single pansy or viola, any little bit of color and scent. G's favorite is the simple happy daisy. When we moved into our house, I was blown away by two things- the swimming-pool-sized fig tree in the backyard and the two enormous Perle d'Or roses in the garden. They bloom from early March clear through November- even at Christmas, this year. I always have a few clusters of these sweetly-scented (appley?) roses in the bedroom and bathroom while they're in bloom. Often, they are in tiny little bud vases like this one. I have at least a dozen glass, silver, and ceramic bud vases, all under 4" tall, around the house. Three or four are of my own design, two are my friend Katherine's work, and I bought two of Julie Thomas's from her etsy shop that I just LOVE. My own ceramic bud vases are canvases for my love of surface decoration: fluting or slip trailing. 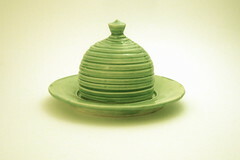 This one, glazed in deep celadon, is hand-carved with a dozen straight lines from mouth to base. This time of year garden flowers are in shorter supply, but the early narcissus and daffodils are coming up, the camellias are still strong, and the lovely twiggy flowering quince and forsythia are in full swing. Yesterday I was given a cluster of lilies, liatris, and my favorite spider mums by a dear friend who provided altar flowers in memory of his family. The taller stems are in a vase together on our table, but I am especially pleased to have the smaller "filler" blossoms for my bud vases this week. During the winter, when the days are as likely to be grey as not, those spots of color can really make my day. Saturday afternoon, when I was having my blissful alone time, I took some pictures of the winter garden and all of my pottery scattered around in it. I don't know about most potters, but I have a hard time pitching a platter, plate, birdhouse, whatever that looks nice except for, say, the small glaze crack the middle of it. I still like the design, I love the leaves that I used in the piece, but it is not functional, not food safe, not really nice enough to use as a display-only piece. 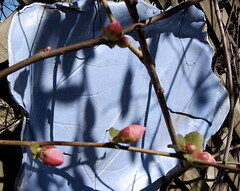 This catalpa leaf platter is one of these pieces, so I wired it to my fence. It sits behind a wild, rangy flowering quince, next to a japanese maple bowl, next to a broken sea urchin, next to a porcelain bird's nest, next to a warped and cracked St. Francis. They are all more or less lined up on the upper portion of the fence, wired tight to the lattice, peeking out from behind twiggy bushes and wisps of Carolina Jessamine hanging down from the trees. I'm not sure if they look junky or creative, but they mostly make me happy. I've planted oxalis and other tiny bulbs in cracked cafe au lait bowls, half-buried in flower beds, and I keep a couple of smallish bowls on my potting bench for scooping potting soil or collecting currant tomatoes in the summer. I remember when my mother was visiting at our old house she rescued some of these bowls from the yard (one in particular was turned over to provide a resting place for the toads), incredulous that I'd put them out in the dirt or filled them with birdseed. 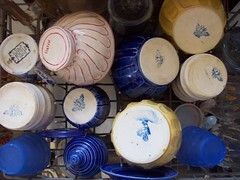 Recently, at her house, I spied one of these imperfect old bowls in her cupboard. It is her favorite guacamole bowl, she said. Today is my desk-day. I'm working on taxes, so this post is as close as I will get to pottery until tomorrow. I hope you all have a beautiful week! I find myself making this from over and over again. This photo is one of the first butter dishes I made, inspired by the straw bee skeps scattered around the kitchen gardens in Old Salem, a historic district in Winston-Salem, NC, also the home of Salem College. I made the horizontal ridges with a Jepson wood profile tool just after throwing, while the piece was still wet. The top form is a bottomless cylinder, collared in at the top and closed with a finial form. I use my lid calipers to ensure a snug fit between the saucer and lid. These come in celadon, yellow, and cobalt, in a variety of sizes and are good for covering cheeses as well as butter. Also, I have to say thank you to Molly over at Mollycoddle for showcasing my little sea urchin, blog, and etsy store. Thank you, Molly! The blog love couldn't have come at a better time!